NOTE: Attached please find Bob Feathers photo, Lori Payne photo, Kingsport Chamber logo and State of Your Kingsport Chamber Holiday Breakfast logo. KINGSPORT, Tenn. – The Kingsport Chamber today celebrated an incredible year filled with several highlights and accomplishments at its State of Your Kingsport Chamber Holiday Breakfast at the MeadowView Marriott Conference Resort & Convention Center. Nearly 400 Kingsport Chamber members and business and civic leaders attended the event that showcased some the Kingsport Chamber’s many achievements from 2018 and previewed some exciting plans and events for 2019. Outgoing Kingsport Chamber chair Bob Feathers, president of WorkSpace Interiors and owner of East Coast Wings Grill, highlighted some of the organization’s many achievements from the past year and incoming Kingsport Chamber chair Lori Payne, controller for Contour Glass, addressed the organization’s plans and events for 2019. For the past year, Feathers noted more than 25 businesses celebrated ribbon cuttings or groundbreakings in Kingsport; Fun Fest marked its thirty-eighth festival; Visit Kingsport attracted more than 20,000 visitors for a $42 million impact on the local economy; Keep Kingsport Beautiful received another award of excellence; 360 local high school students graduated as Tennessee/Virginia Scholars; STREAMWORKS hosted the state’s largest Lego competition; Government Relations hosted every gubernatorial candidate; Leadership Kingsport completed six community impact projects; KOSBE provided counseling and training to more than 160 individual clients and assisted in record capital formation of more than $10 million dollars; and Healthy Kingsport helped Kingsport become the first city in the nation to achieve more than two million miles of documented physical activity for a year; among many other events and highlights. For 2019, Payne commented the Kingsport Chamber would continue to improve upon its legacy of excellence. Some plans for next year include launching a new member marketing campaign; supporting small business success, especially through KOSBE’s Propel Mentor/Protégé program; continuing to support Roosevelt Elementary School’s Leadership Academy; protecting business interests by lobbying local, state and federal leaders; hosting another World Long Drive competition; continue to develop leaders – both the business professional and our high school students – who give life to community dreams; welcoming more than 2,000 visitors from some 20 countries around the world in June as Kingsport hosts the International Underwater Robotics Competition; continuing the nationally-recognized efforts to beautify the city and preserve its gorgeous natural environment; walking 2.5 million miles and continuing to champion the importance of health, nutrition and fitness to individual lives, to the bottom lines of businesses and to the overall well-being of the community; and celebrating as Fun Fest produces its thirty-ninth festival; among other goals and events planned. In addition, the Kingsport Chamber honored longtime Kingsport business, economic development and community leader Larry Estepp with its prestigious Lifetime Member Award during the event. Estepp is president of Citizens Bank. 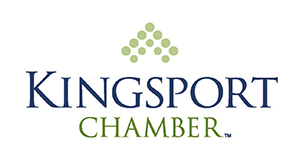 Your Kingsport Chamber’s Membership program attracted more than 50 new members and topped $400,000 in membership revenue. Your Kingsport Chamber also hosted 24 ribbon cuttings and groundbreakings. These companies included: Appalachian Cultural Music Association Mountain Music Museum; Anita’s Snack Foods; AtWork Personnel; Burgerim; Creekside Behavioral Health; City Electric Supply; Cora Physical Therapy; Crystal City Townhomes; Do Good GOODS; Eastman Credit Union; Farmers Home Furniture; GRIFOLS; Kingsport Pediatric Dentistry; Mad Greek; Master Precision Machining; Meade Tractor; Mercantile on Broad; PETWorks; Popeyes; Powell Valley National Bank; RCAM Academy; Surf N Brew; The Villas at River Bend; and Tranquility on Center Salon, Spa & Boutique. The membership department also created a new fundraiser this year. BrewHaHa: A night of pizza, beer and laughs! which had a sold-out crowd of more than 200 people. Thanks to the superb efforts of Visit Kingsport, this vital tourism program supported 41 meetings and conventions with an estimated economic impact of $19.2 million. Visit Kingsport also hosted, supported or operated 25 sporting events with an estimated economic impact of $23 million. This campaign resulted in over 27 million impressions and more than $1.3 million in global media value. In addition, Golf Channel’s nationally televised World Long Drive Tour’s Tennessee Big Shots was held in Kingsport at Cattails MeadowView. This brought substantial national attention to the city and region. Fun Fest celebrated its thirty-eighth year with more than 120,000 attendees from 35 states and 142 Tennessee cities enjoying more than 130 events and activities, most of which were free of charge. Fun Fest was also voted as a Top 20 Event in the Southeast by the Southeast Tourism Society, and was named as East Tennessee’s Best Festival in the Best of Tennessee list in Tennessee Magazine and the popular festival was voted as the Best Event in the Kingsport TimesNews’ 2018 Readers' Choice Awards. Fun Fest’s total economic impact on Kingsport exceeded $6 million. The Kingsport Chamber’s nationally-recognized Keep Kingsport Beautiful program received another Award of Excellence from Keep America Beautiful. Keep Kingsport Beautiful received a $95,000 Special Litter Grant from the Tennessee Department of Tourism to help with our city’s litter prevention efforts. Keep Kingsport Beautiful also hosted Clean Sweep Kingsport, an event that witnessed more than 330 volunteers contributing nearly 1,000 volunteer hours valued at more than $24,000. The Kingsport Chamber’s Workforce Development/Education program graduated 360 seniors as Tennessee/Virginia Scholars. The Kingsport Chamber, the city of Kingsport and Kingsport City Schools also started working together this past year on an initiative involving Roosevelt Elementary School, where hope is being brought to students who come from one of the lowest socio-economic backgrounds in the city. The Roosevelt Elementary Leadership Academy is having a profound and lasting impact on these students lives. In partnership with Eastman, the Kingsport Chamber’s STREAMWORKS program continues to collaborate with industry and the school system to provide relevant extracurricular STEM based activities for k-12 students to help prepare them for a successful and meaningful career in the twenty-first century workforce. STREAMWORKS also hosted the state largest Lego competition – the “Model City Lego League Qualifier” – and it was a vital partner in Dobyns-Bennett High School and D-B EXCEL’s underwater robotics teams this year. The Kingsport Chamber’s legislative affairs committee reviewed more than 1,000 pieces of legislation and took positions on several bills that impacted business. The program also hosted ten events with local, state and national elected officials and hosted one-on-one meetings with each candidate running for Governor. The Kingsport Chamber’s Leadership Kingsport program’s 33 class members presented six Community Impact Projects, ideas and efforts that seek to sustain the economic vitality and enhance the quality of life for our City. These included: Safe Communities America, Capacity Building for Organizational Sustainability, Kingsport History Museum, Senior Center/Renaissance Center, Kingsport Farmer’s Market and Helping the Kingsport Homeless. Forty-two sophomores graduated from the S.H.O.U.T. !® Youth Leadership program. Kingsport Leadership Programs also hosted “Catch Me If You Can,” a cybersecurity conference featuring Frank Abagnale. The Kingsport Chamber’s small business program, the Kingsport Office of Small Business Development & Entrepreneurship (KOSBE), provided counseling and training to more than 160 individual clients; assisted in record capital formation of more than $10 million dollars; held 22 training events; supported 9 new business starts; and helped create 43 new jobs and retain 49 jobs. In partnership with the Knoxville Chamber, KOSBE also announced the inaugural Propel Mentor/Protégé Program featuring GrowthWheel, which is a one-of-its-kind opportunity designed for woman-, veteran-, and minority-owned small businesses and disadvantaged businesses including rural, economic or social disadvantage. There are eight participants in this year’s class who are all Kingsport Chamber members – just one of the many perks of the program. Last year, thanks to the leadership efforts of Healthy Kingsport, Kingsport became the first city in the United States to log 1.6 million miles of physical activity in a year’s time. This year, the goal was to log two million miles. Healthy Kingsport rallied the city, and this year the community logged 6.7 million miles of physical activity in less than a year’s time. Kingsport is the first city in America to accomplish this feat! This nationally-recognized program also hosted the region’s largest health and wellness expo with more than 2,500 participants at its Walk for Wellness Expo and supported 70 organizations in becoming a tobacco free campus with 751 associated campuses, positively impacting 42,138 employees/parishioners. To date, more than 280 Kingsport businesses and organizations are part of Healthy Kingsport’s Live SugarFreed effort with 97 not selling, providing or promoting sugary sweetened beverages, positively impacting approximately 20,000 people. Feathers and Payne also commented on the Kingsport Chamber’s efforts to support and promote the region. “We will continue to be a vital partner at the regional table, promoting and championing this region as the best place in the country to grow a business, educate your children, nurture your faith, enhance your health, raise a family and make a life,” Payne remarked. The Kingsport Chamber will continue to celebrate Kingsport at its 72nd Annual Dinner. “Kingsport’s Social Event of the Year,” the Kingsport Chamber 72nd Annual Dinner, is Friday, February 1, 2019, at 6 p.m. at the MeadowView Marriott Conference Resort & Convention Center.